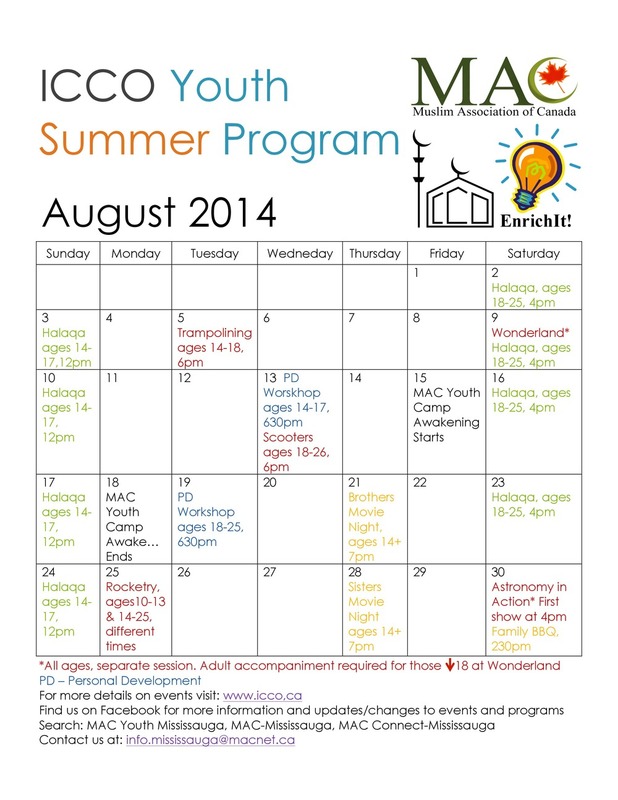 Below are the ICCO's scheduled events and programs for the month of August. Alhamdulilah we have a variety of great events planned for all ages. For more detailed information about the programs and events, click here. We hope to see you, your family and friends at the ICCO! We have recently updated our events page to include a handful of events and programs we have scheduled for this blessed month. Click here to be redirected to our events page where you can stay up to date with upcoming ICCO programs and events. There are many fun and beneficial events for all ages planned for this month and after so be sure to frequently check back to see what's new! May Allah grant you and your family every blessing this month has to offer and see you at the ICCO! As the blessed month of Ramadan draws nearer and we prepare to welcome it into our homes, cleansing ourselves spiritually, MAC Mississauga is proud to announce the first Annual Ramadan Program at the new Islamic Community Centre of Ontario (ICCO). We invite you all to spend Ramadan at the ICCO where many of our programs will be held inshaAllah. Taraweeh prayers will take place in the newly renovated musallah (prayer space) led by distinguished huffaz, offering a peaceful and quiet experience while the children's programs will run in a designated part of the building. During the course of this holy month we will have several great events such as the Quran Competition, Youth iftars, lectures, and halaqas. Qiyam and I'tikaf during the last ten nights. And another children's camp following the huge turn out and success of last weeks camp. Community Iftars will be held every Friday during Ramadan followed by the regular Taraweeh program. If you would like to help with Ramadan activities please fill out the form below or send us an email. Volunteering is based on availability and not a daily commitment, we want our volunteers to be able to help out but also be committed to their personal development during this month. We are excited to see you all during this blessed month! Oh Allah, bless us and have mercy on us and let us reach Ramadan. We pray this message is reaching you in the best state of health and iman. Its been an exciting journey since we purchased the building thanks to the generous assistance of our community. For the past 9 months our team of architects have been tirelessly volunteering their time to ensure the master plans for the Islamic community centre of Ontario(ICCO) not only reflect the ambitions and needs of our community, but that they also show a harmonic balance between functionality and beauty, with a design inspired by a rich heritage of Islamic and Canadian architecture. While our architects toiled away, our other volunteers kick-started some successful programs such as the Al-Otrojah Quran Academy, Family night, the Mini-Muslim centre, MAC Connect programs, Open Spaces and our Learning Centre. Alhamdulilah these programs have benefited many in our community and have breathed life and energy into the ICCO while we were finalizing the master plans of the building. After many long days, sleepless nights, intense discussions and many drafts, we are excited to share our vision with the community. Join us along with our esteemed guest speaker Sheikh Abdalla Idris as we reveal the future plans for the ICCO and present what we have been working towards. We can't wait to share the ICCO experience and architectural vision with the community. Your donations are tax deductible. Tax receipts will be issued on behalf of the Muslim Association of Canada (MAC). Ultimately what we all desire is to please Allah and to have for ourselves a mansion in paradise. Help build the ICCO and Allah will build for you a beautiful house in Jannah. Visit http://icco.ca/donate/ donate now and have plaque signed by you to be hung at the new centre. While the old logo served its purpose, with a new ICCO we want to present a new logo that will illustrate what the ICCO is all about. To do this we will be having a logo submission competition open to everyone and the best logo will be selected as the official ICCO logo displayed everywhere. Submit your logos by sending an email to icco@macnet.ca. You can see the latest submissions online via the Mac Mississauga Facebook Page. The ICCO logo should embody the concept of community and Islam. Most of the submissions we’ve received so far are either a masjid, or just a play on the four letters I C C and O. The logo doesn’t have to be any of these, don’t be scared to do some creative and unique. Whatever logo we decide to finally use has to go on all our print materials, ads, banners, web pages and even contracts. Simply put, it has to be versatile. Flat logos are better than gradients; the image needs to look good whether it’s big, small, colored, black and white and so on. Could your submission be engraved easily or is it too intricate? Can be printed on a transparent surface? Do the colors clash with a white background or a black one? This contest is open to any sort of submissions. Whether you’ve made a 3D render or drawn it out with pencil crayons, if we like it we will ask for more. We are however looking for something special in a logo and would love to see something impressive. Please note that any logos submitted are considered to be entitled to be used by MAC and MAC affiliates and all intellectual property rights will be waived. But don’t worry; you’ll receive recognition for your good work. The Islamic Community Centre of Ontario was once a focal point for community activity in the GTA, and it was more than just a place of worship. It brought together Muslims from all over Toronto to enjoin in prayer, recreation, education and celebration. For families it was a great way to keep in touch with other Muslims, and for the youth it was a centre for guidance, activity and knowledge. I was one of the youth that grew up in that era. For us, the ICCO was an integral part of our lifestyle and in its absence it was sorely missed. This year we have the opportunity to give back by creating this community centre and making it a gift for future generations. The ICCO was more than just a place of worship; it was the heartbeat of the Islamic Community. Have you donated lately for the ICCO? We are expecting your positive feedback and contribution to the new ICCO, above all your donations to help realize this beautiful dream of the community. Tell me about the new ICCO! The Islamic Community Centre of Ontario (ICCO) was a project established in 1997 with the scope of a masjid, recreation centre, banquet hall and school. To date MAC has fulfilled its promise of the school with great successful, by the will of Allah SWT, through the Olive Grove School. The organization is now completing its promise to implement the Masjid, recreation centre and the banquet hall through its newly purchased location at 2550 Dunwin Drive near Winston Churchill and Dundas in Mississauga. Why we need the ICCO? The Muslim Community in Mississauga and surrounding cities is in a dire need for the Islamic Community Centre of Ontario project. In addition to the existing large Muslim community, the GTA receives significant number of immigrants every year causing a major gap in services and institutions to support them. The objective of the ICCO project is to build a welcoming institution that will service the community and protect the Muslim identify of our children, families and community; as a result establish an Islamic presence in Canada that is balanced, constructive, and integrated, though distinct, in the social fabric and culture of Canada.